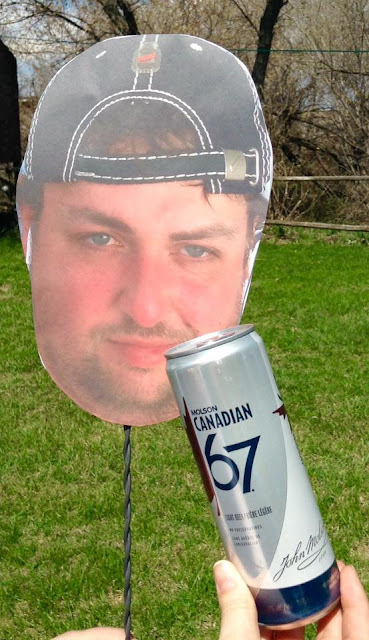 I'm not a fan of Alexander Keith's, when I go to the pub, I will drink Kokanee or Rickards over a Keith's. 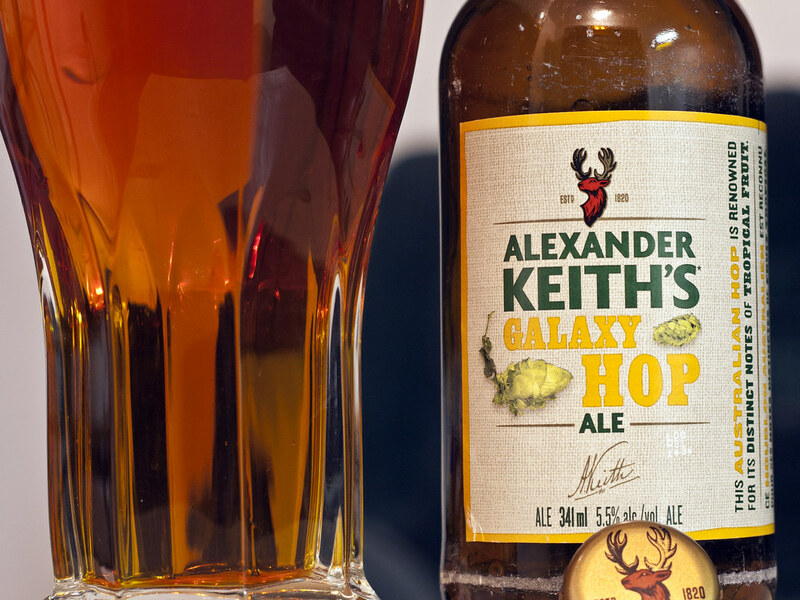 Keith's alone ruined the name "India Pale Ale" for the Canadian beer industry, so whenever a typical Canadian beer drinker thinks of an India Pale Ale, they think of Keith's, so when they try something with hops and flavour, they come in for a surprise. That said, I have to try just about ANY new beer that comes out, and I had to purchase their new Hop Series taster pack to get a sample of what to expect of their newest creation Galaxy Hop Ale. At $28 after taxes and deposit, the case contains 3 standard Keith's, 3 Cascade Hop Ales, 3 Hallertau Hop Ales and 3 bottles of the new Galaxy Hop Ale. I love galaxy hops as they give off a nice sweet tropical aroma and flavour of it, makes you think of being on a beach, a beach near a hop farm in a tropical land. Appearance: The Galaxy pours a clear honey-amber ale, much darker than the standard Keith's, which pours a light piss yellow. A thick amount of light-beige head that quickly diminishes within a few minutes leaving film on the side of the glass. Aroma: Very reminiscent of the tropical IPAs that come out of New Zealand and elsewhere, a pineapple & citrusy zested hoppiness followed by even more sweetness to it, light amount of caramel, light amount of alfalfa floral bitterness, there's almost a "lollipop" sweetness to it. Taste: Average at best. The sweet tropical hoppy notes don't really come forward in the flavour. It's pretty flat to be honest, possibly due to if the hops have since gone past its prime in the beer because we all know this beer has been sitting in a warehouse for 6-8 weeks as it is. There's some caramel malt in it, a very very slight amount of pine bitterness that I can't really seem to notice. No pineapple, no lemon. Bit of a metallic aftertaste. I want to like this because I love Galaxy hops, but this is just.. boring. Overall Thoughts: Great zesty aroma, but it doesn't keep tropical zest in the flavour. I'm not sure why it would be so misleading. 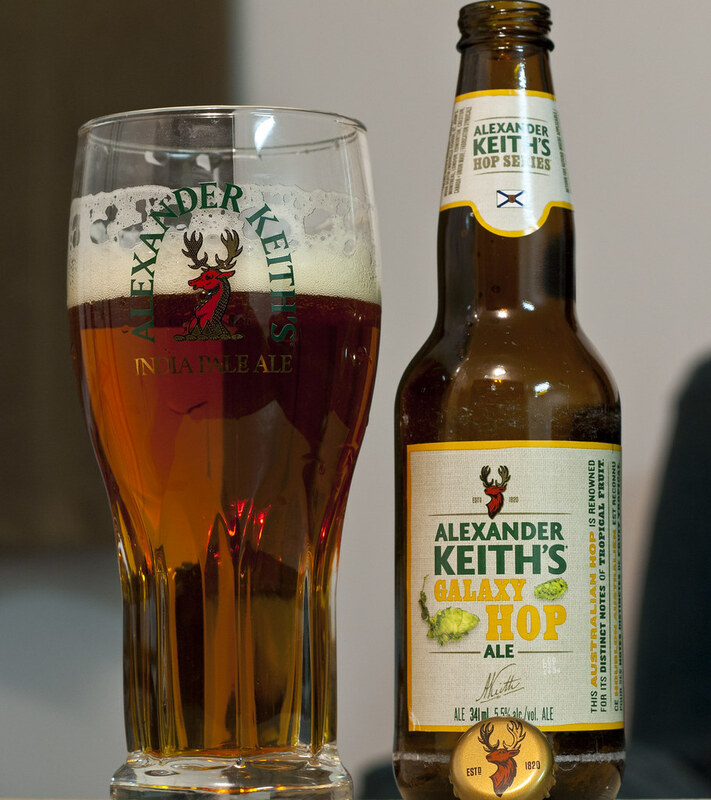 Sure it's immensely better than the standard "Keith's IPA", but for a Galaxy Hop Ale, I want citrus zest, I want pineapple, I want hops, I want a party in my mouth. That's asking wayyyyyyy too much though. 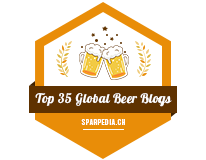 Their Cascade Hop Ale (Review) is better.. and I was harsh in that review too but the Cascade Hop Ale has turned into one of my regulars over the last few months. Really? Cause I really like it and think it's a better beer then most out there!